Annual inflation in Latvia climbed past 3% for the first time in more than a year in Setptember according to data released by the Central Statistics Bureau (CSB) October 8. Prices of goods grew by 3.3 % and prices of services by 2.9 %. 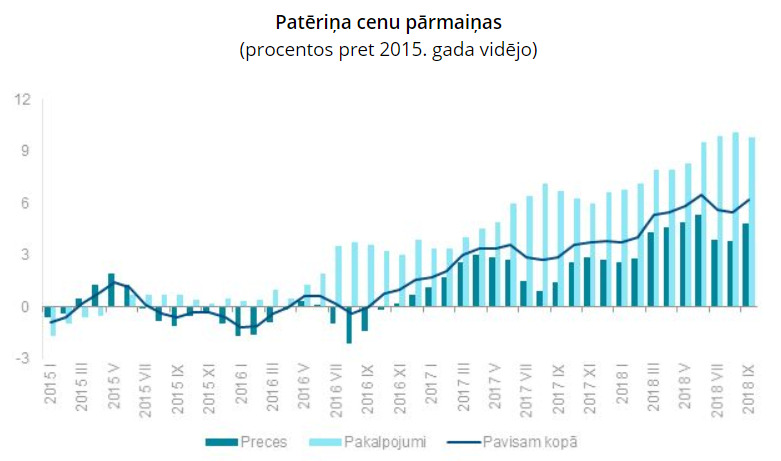 Compared to September 2017, in September 2018 the average level of consumer prices was mainly influenced by the rise in prices of goods and services related to transport, goods and services related to housing, alcoholic beverages and tobacco products, food and non-alcoholic beverages, as well as prices in miscellaneous goods and services group. Compared to August, in September 2018 the average level of consumer prices increased by 0.6 %. Prices of goods grew by 1.0 %, while prices of services fell by 0.3 %. Commenting on the data, Swedbank said: "In September for the first time this year the annual inflation rate surpassed 3%. In comparison, last year the annual inflation rate was 3% or more for five months. In the coming months, we expect the annual inflation rate to hover around 3%, mostly influenced by the same factors as in the past few months. Taking into account the slow annual inflation rates in the beginning of the year, average annual inflation this year is expected to be moderate – around 2.6%."